Well spring is here and it’s planting time. I plan on having some yummy fruits again this year in my garden. My watermelon last year was so good. Here is a recipe that will go with any fruit you want and make an excellent quick healthy breakfast. I love blackberries and kiwi which both would go well with this dish. Enjoy! 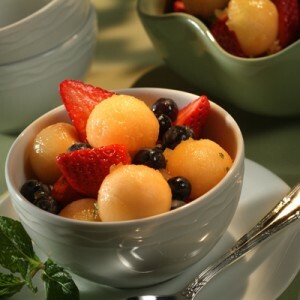 Add cantaloupe, strawberries, blueberries and mint in medium bowl. Spoon into serving dishes; drizzle with juice mixture. Did you make this recipe? If so please let me know how you liked it or if you changed anything. Do you have a quick healthy breakfast idea to share? Please contact me to get any of your recipes published.